This book covers the main aspects of craftsmanship for children’s short story writing for the middle age group (8-12 years). Focus is on testing the initial idea for its suitability in the short story framework, character development, mastering basic language, plot and scene structure, dialogue, pacing, the beginning, the twist, the plan and the concept of ‘SHOW, not tell’. The fundamental importance of conflict and rising tension in the story is highlighted throughout. The text reveals some original perspectives and methods which will benefit anyone working with this genre. The author uses samples from his own work to clarify the theory, and many chapters offer imaginative exercises designed to develop specific skills. From the start, the writer is encouraged to think dynamically about their writing for this market. 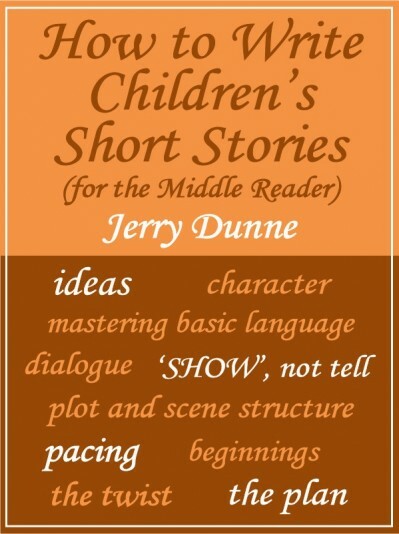 To discuss any aspect of How to Write Children’s Short Stories (for the Middle Reader) you may contact the author via his “Contact Me” tab on this blog, or on the form at the end of this page. Short story writing is a difficult genre to master, and I would suggest that the children’s short story in some respects poses greater difficulties for the writer. In adult fiction, we can explore a great deal of the psychological and emotional without drawing on a strong physical side to the story, and many of the best tales are developed with powerful understatement. There is very limited physical plot movement, which means that the story’s word length can be easily controlled. In the children’s short story for the middle reader (8-12 years), though the emotional is hardly ignored, the emphasis is on the physical journey of the plot. The child reader is not intellectually and emotionally mature enough to deal with a narrative that leans more toward the psychological or emotional side of storytelling, especially when understatement is part of the mix. There is also far less leeway to delve into experimentation in the children’s genre. To create a strong physical plot (with a beginning, middle and end) within the short story’s word limit requires a fair bit of skill. The reader must always be aware of strong plot movement, and with the greater emphasis on the physical, the writer often has to commit far more words to paper. Of course, fairy tales are often very short with traditional plot structures, and might be viewed as a good guide for the children’s short story; except the fairy tale is a forerunner to the modern children’s short story, and not on a parallel with it. The fairy tale is a different genre of literature. The fairy tale’s characters are drawn sketchily and mostly two-dimensional, often working just as plot-devices, and the fairy tale often lacks convincing description. The modern children’s short story is more sophisticated. We must have well-rounded character and far more detailed description in the most important points of the story (particularly in the action scenes), and fully worked out plots (yes, emotional as well as physical), all of which take a far higher word length to accomplish than that of the fairy tale. Yet, we must remain within the general 6,000 word limit of our short story genre. This work is really for the beginner or semi-experienced writer, but the more qualified author with no experience in writing children’s short stories may find some of the chapters useful. We will explore the basic craftsmanship necessary for fiction writing, but with special emphasis on its place within the children’s short story for the middle reader (8-12 years). I use examples from my own work throughout to help clarify the theory. I recommend that you approach the book in the following way: read the book once through to give yourself an idea of the whole task to be undertaken; then prepare to go through the book much more slowly. Chapter 1, ‘Does the idea have legs?’ explains why and how a story works. Character is the heart or engine of the story and conflict is its fuel, so without conflict character does nothing of any consequence. Chapter 2, ‘Sparking up the characters’, and Chapter 3, ‘Build character through ‘SHOW, not tell’’, starts you on the road to character development. Chapter 3, introduces the concept of ‘SHOW, not tell,’ a fundamental skill that must be developed in all fiction writing. Chapter 4, ‘Mastering basic language’ is necessary reading for the beginner. You are hoping to become a competent storyteller and words are your tools for accomplishing this end, so you have to practise mastering the basics of language from early on. When you feel confident you have grasped the essentials of the early chapters, spend time with Chapter 5, ‘Plot and scene structure’. The short story must be structured properly or you will not have rising tension which is an absolute necessity in all fiction writing. This chapter is of paramount importance. The concept of ‘SHOW, not tell’ is discussed in earlier chapters. Chapter 6, ‘More ‘SHOW, not tell’’ tackles the subject in further detail. The budding writer should come to appreciate the difficulty of mastering this skill before reading further into the book. Dialogue is of fundamental importance to the story, but you need to understand plot and scene structure before you attempt Chapter 7, ‘Good, well-structured dialogue’, as the emphasis here is not just on dialogue structure itself, but its place within the overall plot and scene structure. In Chapter 8, ‘Pace the story’, we see that pacing is an elusive skill to acquire because it does not ever stand alone, but is very much blended in with other narrative skills. You need to have absorbed the material of the earlier chapters before making a study of this one. Chapters 9 and 10, ‘Beginnings’ and ‘Satisfying twists’, are left near last, not due to their lack of importance, but simply because other skills should be developed before these ones are studied in depth. Chapter 11, ‘The plan: a bird’s eye view’, considers how to plan a story. Once you have a firm grasp of basic craftsmanship, particularly plot and scene structure, this chapter will be easier to grasp. Every athlete, no matter how talented and no matter how far advanced in their discipline, still exercises to improve or maintain their performance. This is a given in the world of sport. In the creative writing world it is a given that the only way for a writer to improve is through practice. Fiction writers write stories – this is their main way of exercising. But it is not the only way of exercising. Just as a runner may also work out with weights in the gym to improve his strength and condition his muscles in ways which will actually help his running, so too, a writer can perform exercises in isolation to concentrate on and help improve specific parts of their craftsmanship. Wherever I think it is useful I have included exercises. By attempting the exercises, you are able to work on a particular aspect of craftsmanship in isolation, and this will help you focus sharply on both developing the specific skill and absorbing and retaining the theory behind the exercise. allowing you a means to gauge easily what, how much and how quickly you are learning.